If you want your property cleared as soon as possible, you need to call in the professionals! The next big snowstorm will be here before you know it! Snow can easily create dangerous driving and walking conditions. Commercial businesses need to appreciate the dangers that snow can cause to their employees, customers, and guests. One of the best investments you can make as a business/property owner is hiring a reputable commercial snow removal team to help rid your property from snow and ice, that would otherwise create hazardous conditions. Continue reading to discover some of the major benefits of investing in commercial snow removal! If you want your property cleared as soon as possible, you need to call in the professionals! They have the tools and equipment to get the job done right as quickly as possible. The longer you wait, to have your property cleared, the more problems you will probably have on your hands. Safety should be a top priority for all commercial business and property owners. It is imperative that you ensure that your outside property is safe for everyone who comes on it or near it. 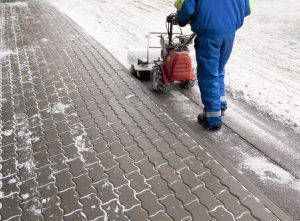 A reputable commercial snow removal team like JFK Lawn and Landscape will leave your property safe. Snow can often be a huge inconvenience. If your commercial property is covered with snow or ice, it could inhibit customers from entering from entering your location in a certain way. A commercial snow removal service will help decrease downtime, so you do not lose downtime or inconvenience your employees or customers any longer than you have to. As a business owner, the last thing you want to have to worry about is the weather. By hiring a team of professional to clear your property of snow, you can focus on other important aspects of your job. Give JFK Lawn and Landscape A Call! JFK Lawn and Landscape is a local snow removal company. We provide complete commercial snow removal services which include snow plowing, sidewalk clearing, ice control, snow hauling, de-icing, and hand shoveling for commercial properties. Our snow removal professionals are always prepared to prepare our customers with 24-hour commercial snow removal services. This entry was posted on Saturday, December 15th, 2018 at 5:01 pm. Both comments and pings are currently closed.